Our guest this week is Dennis Walters, the star of the Dennis Walters Golf Show! Dennis is one of only eleven honorary lifetime members of The PGA of America. The PGA of America. Earlier this year, the USGA awarded Dennis with the Bob Jones Award during the U.S. Open at Shinnecock Hills. Next year, Dennis will be inducted into the World Golf Hall of Fame. Our guest at The Back of the Range Golf Podcast this week is Ben Cowan-Dewar. He is the co-founder of Cabot Links in Inverness, Nova Scotia. With both of their courses, the Links and the Cliffs, rated as Top 100 Courses in the World, Ben Cowan-Dewar along with his team have turned a small town that was a relic of the coal-mining industry Canada’s first and only authentic links golf resort. Ben shared his story of how a vision can become a reality. 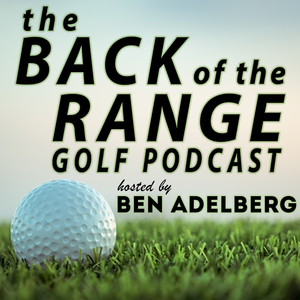 This week, we welcome Gary DeSerrano to The Back of the Range Golf Podcast. He is the founder of the APT Tour, which is the largest developmental tour in the mid-south region of the United States. In addition to raising thousands of dollars each year for charity, these events provide an avenue for professional golfers to hone their skills while preparing for a life on the PGA Tour. This week, we are thrilled to welcome Coach Laura Ianello from the National Champion, Arizona Wildcats Women's Golf Team. After barely making match play last year as the #8 seed, they ran through Baylor, UCLA, Stanford, and finally Arizona to capture the title. We spoke to Coach Ianello about her start in the game, her career as a player at Arizona, and the exciting ride to her first National Championship as a Coach. This week, we talk to a true legend from the world of sports. In fact, he is the best in the world....at streaking! Our guest this week is Mark Roberts from Liverpool. He's streaked the Ryder Cup and The Open Championship, as well as Wimbledon, the Super Bowl, and the Olympics. He shared some amazing stories from his exploits at the largest sporting events around the world. After hanging with a couple U.S. Mid-Amateur Champs the past two weeks, we head back to the college ranks and we welcome Jacob Wilner, Men's Head Coach at the University of Nevada. Jacob played collegiately at Coastal Carolina University before studying underneath Hank Haney at his International Junior Golf Academy. Jacob shares stories from his USGA appearances and time at the University of Nevada! Another U.S. Mid Amateur Champion visits us here at The Back of the Range Golf Podcast! This time, it's the 2017 Champ, Matt Parziale. We spoke about his amazing ride in the US Mid Am last year, his Masters appearance, making the cut at the U.S. Open, and some great stories from The Concession Cup. Enjoy the episode! Our guest this week is Mike McCoy from West Des Moines, Iowa. A lifelong amateur and legend around the amateur golf circuit, Mike has racked up an impressive career. During this episode, Mike shares stories from his 2013 U.S. Mid Amateur win and the invite it brought to the 2014 Masters. He also spoke about his role on the 2015 U.S. Walker Cup team as "Uncle Mike". Great stories from a true gentleman of the game.....recorded live from Pine Valley during the Crump Cup! Our guest this week is Michael Kartrude from West Palm Beach, Florida. Michael plays professionally on the Mackenzie Tour in Canada and he shared some great stories from his life on the road and also from his time working at The Bear's Club in Jupiter. With college golf starting up again, we figured this would be the perfect time to catch up with men's coach Alan Bratton from the defending national champions, Oklahoma State University. We discuss his approach to coaching, his victories as a player AND a coach, and his experience caddying for two U.S. Amateur champions. Our guest this week is Hannah Fleming, the assistant curator of The British Golf Museum in St. Andrews, Scotland! Very educational and interesting episode revolving around golf history, interesting artifacts at the museum, and the origination of the Claret Jug. Great episode for anyone interested in golf! Our guest this week is Sheena Willoughby from The Dunvegan Hotel in St. Andrews, Scotland. After owning the Dunvegan with her husband Jack for nearly 25 years, Sheena shared some great stories! The Dunvegan is the most famous 19th hole in the world, as well it should be! After all, it is only a 9-iron away from The Old Course. Presidents, major champions, and celebrities have raised a pint in this pub over the years, and Sheena has the stories and the pictures to prove it! Tons of great stories in this episode!